The conference's keynote speaker was Dr. Yesenia Madas, Dean of Brookdale Community College's Freehold Campus, and the former executive director of the New Jersey Center for Student Success. Leslie Hampton discussed confidence and branding with students during one of the conference's breakout sessions. West Windsor, N.J. – Mercer County Community College (MCCC)’s Equal Opportunity Fund (EOF) program is hosting special events to commemorate Women’s History Month in March. EOF ushered in the celebration with a discussion on “Human Trafficking” on March 1. Guest speaker was Gwendolyn Cook, an activist, author and law enforcement chaplain who works on the frontlines with the FBI, New Jersey Crime Victims Law Center, the Attorney General’s Office, and local police. In a second event on March 9, Mercer students and those from other colleges around the state attended a daylong conference on the West Windsor Campus. 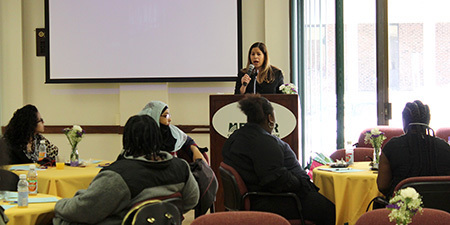 The conference, entitled “The Process: Finding Beauty in the Journey of Knowing Me,” featured keynote speaker Dr. Yesenia Madas, Dean of Brookdale Community College's Freehold Campus. Using the growth of a mature, majestic tree as an example, Dr. Madas noted that the tree's early stages as seed and sapling are also necessary and important. Mayers said that Dr. Madas' message resonated with students. "She candidly shared her own personal journey as a first generation high school and college graduate. She encouraged students to embrace the stage they are in, even as they face challenges along the way to equipping themselves for future success." The conference also included workshops and breakout sessions centered around discovering one’s inner strength and beauty. A panel of young female professionals in the technology, business and communication sectors shared their experiences and offered valuable insights. 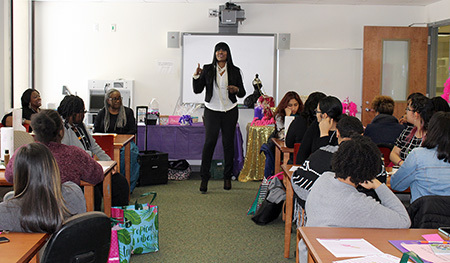 In addition, an image consultant discussed the importance of having a personal brand and signature when meeting others in both professional and personal settings. Finally, a physician and a social worker offered advice on physical, mental and emotional wellness. Women’s History Month at Mercer will close out on Thursday, March 29 as EOF hosts “Arts and Advocacy” at noon in the West Windsor Campus cafeteria. The event will focus on the arts as a platform for advocacy, empowerment and expression for contemporary women.